As educators, we know that no two students learn the same way. This is something that is drilled into us from day 1 of teacher college! So, why do we assess all students the same way? I could go into the myriad of problems associated with standardized testing- but that is not the point of this post. Suffice it to say, any good educator knows that standardized tests don't truly do a great job of measuring what every kiddo knows and can do. That's why I'm a big fan of multiple measures- one of those being a student assessment portfolio. Portfolio assessment is a method of assessment that involves collecting student work over the course of the academic year and using it to showcase strengths, weaknesses, progress, and areas of growth (or lack of growth). Every educator knows that no single measure of assessment gives a comprehensive picture of where our students made progress and what they have mastered. This is especially true for ELLs. Many standardized and classroom assessments leave an incomplete picture due to cultural and linguistic bias. Therefore, the use of performance-based, authentic measures such as portfolio assessment allow educators and other stakeholders to form a more clear, complete picture of a student’s strengths, weaknesses, and progress. What else can the portfolio be used for? Student portfolios make excellent pieces of evidence for many things- including cases where a student is brought up for intervention or possible special education issues. The evidence contained within a portfolio can help experts in these areas determine if the student has issues of concern that go beyond normal second language acquisition associated phenomena. It is also an excellent record of a student’s progress that can be shared with parents or sent on to future teachers with the student’s other records. In the case of portfolio assessment, we want the portfolio to showcase both strengths and weaknesses, and show progress (or lack thereof) that the student has made over the course of an academic year. Therefore, the portfolio should include items that show the student’s best work, as well as items that show need for improvement. Each item included should be accompanied by a rubric or analysis of some sort. Classroom work, informal assessments, and formal assessments can be included. 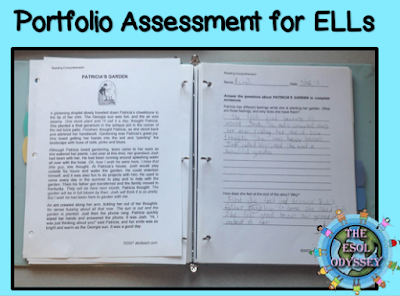 Every year that I was in the classroom, I kept assessment portfolios for each of my ELLs, and I still recommend to teachers that they do the same. While it does add a little extra work to your load, it can make it so much easier when it comes to really assessing the progress your students have made. It can also make your life easier when you need student work samples for any reason- intervention meetings, SpEd referral, or other special services. 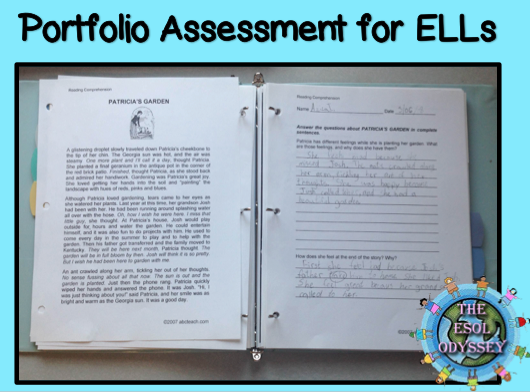 Don't miss my follow up post- Portfolio Assessment for ELLs: Building a Portfolio Assessment System on VA is for Teachers!